Plovdiv, Bulgaria - Current News - Secrets bankruptcy of communism in the Club "Stain of Rorshah"
Secrets bankruptcy of communism in the Club "Stain of Rorshah"
The winner of the three most prestigious awards for journalistic investigation in the country, the author revealed the truth about the secret bankruptcy of communism, the empire of the overseas companies of the Communist Party and the role of state security in the murder of Georgi Markov, a guest once again tonight in Plovdiv, journalist Hristo Hristov will participate in a monthly literary salon "Spirt & spirit" in the club "The stain of Rorshah." 20 years after the withdrawal of Todor Zhivkov from power, investigative journalist and documentary offers the most detailed biography of former Secretary of the Communist Party, who ruled Bulgaria 35 years. 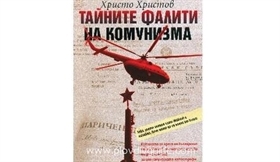 In the book "Secrets bankruptcy of communism" can be found authentic testimonials of former party, government, business and banking elite and the bankruptcy of the communist system and the failure of the economy. Hristo Hristov made 6-year study on the killing of Georgi Markov and allows the reader to immerse into the secret archives to which few have touched.